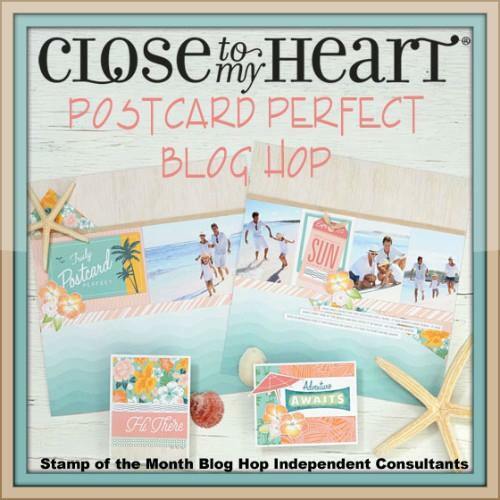 I love celebrating National Scrapbooking Month all May and am thrilled to come to you today with artwork showcasing our fabulous special, "Postcard Perfect". There are 16 Close To My Heart Consultants sharing some fun stuff with you so be sure to make your way around the entire Blog Hop. If you are coming from Wendy's Blog, you are on the right track. Should you get lost along the way, all participant's links can be found here. Before I show you what I created, I wanted to give a quick glimpse of the products associated with this special. There is a lot of goodness including a Cut Above Scrapbook Kit, paper packet (that includes patterned vellum paper), diecuts, and a coordinating stamp set. 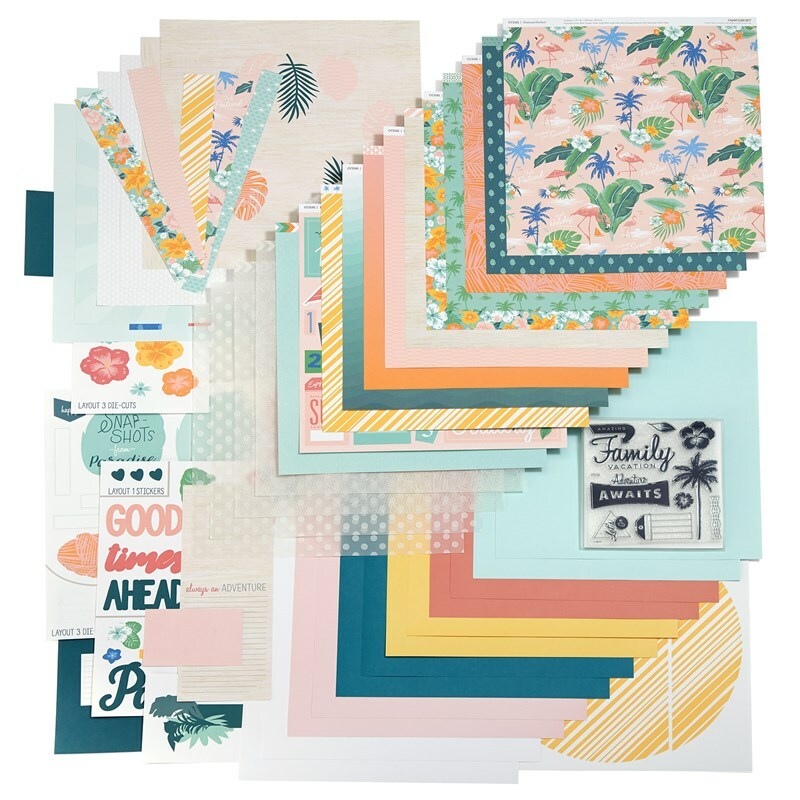 You can get a bundle, with all of the items, for $53.95 (retail value $67.80). Deciding to make a greeting card with the stamp images available on the stamp set (and another one I used for the sentiment), this is what resulted. It makes me want to be at the beach right now; what about you? To generate the look of "sand", I used Toffee cardstock and "tore" an edge. 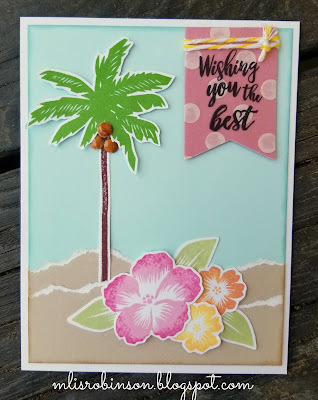 Because our cardstock has a white center - that allows for a lot of fun techniques - this was the result. 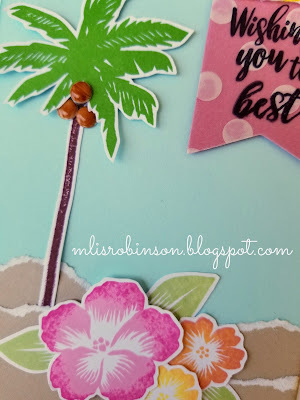 Using the light blue cardstock for the background, from the paper packet, it created for a great blue sky and backdrop. 🌴 The banner was cut from both a piece of the polka dot vellum paper and Raspberry cardstock. So the adhesive didn't show through in undesired areas, I placed it behind the dots. Not wanting the sentiment, from "Sweet Friends - Cardmaking", to rub off, I stamped it with Archival Black Ink and used the craft heater to heat set it. 🌴 To get the two-toned effect on the flowers, I used the "Rock 'n Roll" technique. I inked the image in the lighter color and then "rolled the edges" in the brighter color. 🌴 For the coconuts, I used the Mahogany ShinHan Marker and colored three medium White Dots. Aren't they fun?! Inks used: Pixie, Rapberry, Lemon, Tangerine, and Sorbet. Thanks so much for stopping by! Before heading over to Michelle's Blog, considering leaving a comment, and enjoy the rest of the artwork you see! Love, Love, Love this so much! So adorable! I like the torn paper and LOVE the coconuts. So fun! I love the coconuts! What a clever idea! Love this!! Those coconuts are so cute and clever! Neat card, great idea to create a landscape!